We welcomed Duke to the family two months ago, adopted straight from a shelter shortly after he was surrendered. What can I really say about the state this cat was in when we first laid eyes on him? He was in poor shape, to say the least. Grossly underweight, and his beautiful, long apricot-colored hair was heavily matted. The volunteer who spoke with us informed us that his entire underside had consisted of so much matting, that they had no choice but to shave it off. To boot, his tail was on the slender side, looking disproportionate to his shape and general size, an indication that his nutrition wasn't where it should be. We knew immediately that there would be a lot of work involved, but we knew where Duke belonged: home. The "road to recovery" for Duke had to begin with the most essential task: getting him on a wholesome diet that offered the nutrition needed to make him happy and healthy. I knew nothing less than an amazing food would be suitable, considering that our feline friends and other animal companions eat the same food every day---unlike the varied diet that most of their owners maintain. Naturally, I turned to Wellness as the source for not only adequate, but optimal nutrition to establish and maintain Duke's health. And let me tell you, he was happy with this dry cat food from the get-go! I quickly discovered that Duke is a picky feline, and not just any food will do. He prefers certain flavors, and textures, to others. Through trial and error, I've found he won't even walk up to bother sniffing some foods---whether wet or dry---and impatiently paw at others before I've even managed to finish opening the packaging. Standards certainly suited to royalty, I'd say. Wellness® Complete Health™was a selection that Duke simply couldn't eat fast enough. I was very pleased to find the wide range of Wellness products available at my local Petsmart. He loved it immediately. His preference? The Wellness® Complete Health™ Grain Free Adult with deboned chicken and chicken meal. 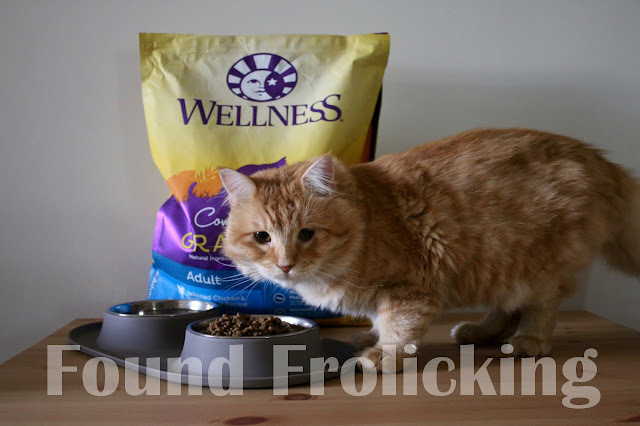 He enjoys this recipe so thoroughly, he will happily chow down a few pieces as a treat between feedings, and even choose it over several brands of cat treats! 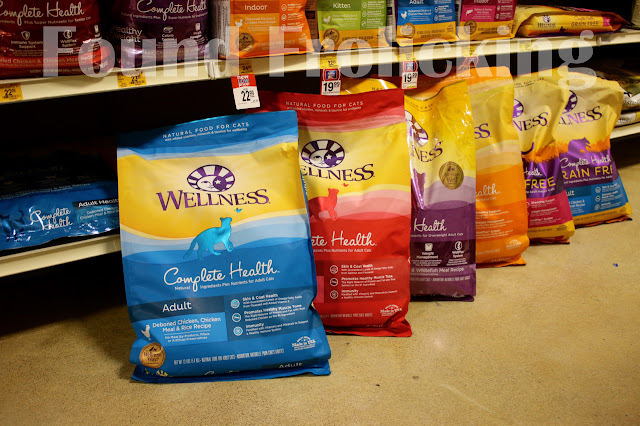 The grain-free options from Wellness are available in three varieties, and in sizes from 2.5 lbs to 11.5 lb bags. The Wellness standard for natural ingredients sets them apart from competitors, keeping their recipes free from unnecessary junk. I was very impressed at how well that these recipes are formulated, sourcing high quality ingredients, including sources of omega fatty acids, to create an excellent food. The Wellness Complete Health cat food has certainly received Duke's stamp of approval, and Wellness is certainly where healthy meets happy! 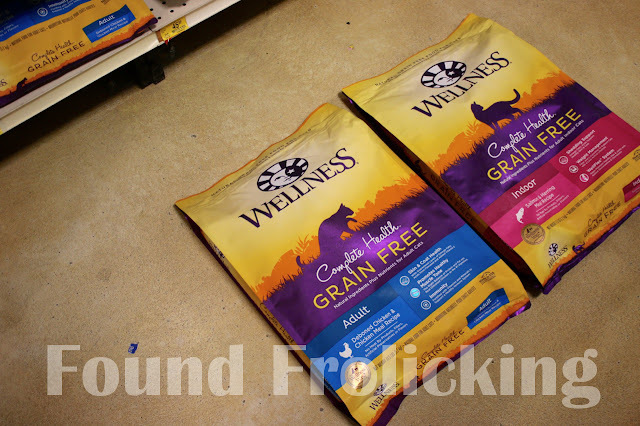 The Wellness varieties of 11.5 pound bags available at my nearest Petsmart location. My local Petsmart carries two of the Wellness Complete Grain Free options. Duke enjoying his breakfast: Wellness all the way. Full and content, Duke is ready for some leisurely time, but not too far from his favorite food! This is a sponsored conversation written by me on behalf of Wellness®. All opinions expressed are my own, and were in no way influenced by the brand or any other sources. The post and all photos with the watermark are the property of Found Frolicking, and should not be used or distributed in any way without first receiving permission. That sounds like a great brand of food. I am going to check it out for sure!! I'm glad that Duke found a loving home. You're doing a great job feeding him with quality food. Lucky dog! So happy Duke was able to turn things around, with your help of course. He looks like a very happy cat and thankful for being rescued. It's amazing what a little love and the right food can do. Thanks for offering Duke a loving place to call home and good food. He is so lucky that he met someone like you. Now Duke looks very healthy. Look at those bright eyes! Ow... handsome cat! Aww Duke looks so cute! I rescued my cats almost 10 years ago. 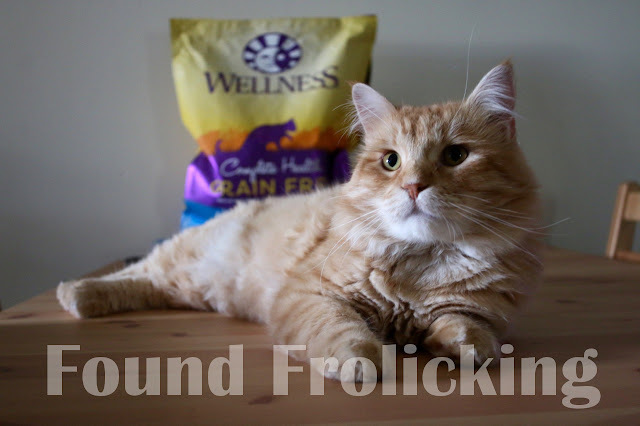 I didn't know about the Wellness pet food brand. I've been researching different brands so I can give my cats a healthier alternative to what they've been eating. I'll have to give this a try. Your kitty is so cute. I would love to have one but I'm scared it will bring a lizard into the house. I am always happy to know that there are people to rescue these animals. I love animals from a distance so glad that everyone is not like me. Duke reminds me of our pet dog, Mikoy. He was really in poor shape too when we rescued him. It is nice to know that there are products that support the health of pets. I guess I have to look for similar product in our local for the pets.